Different manifestations of kidney cancer are caused by different reasons. Clinically, the symptoms are usually the most direct reflection of kidney cancer, which do great help to the diagnosis and treatments. Concerned about kidney cancer symptoms is critical important to the judgment and treatments of kidney cancer patient's condition. The chief complaints and clinical manifestations of kidney cancer patients are changeable, so it is easily to be mistaken as other diseases. Since the hidden kidney position, the main perceivable sign of kidney cancer is urine. Hematuria or bloody urine is the most common symptom of kidney cancer, but which usually appear only after the tumor invades to the pelvis. In some words, bloody urine is not an early symptom of breast cancer. No obvious symptoms: At present, more than 40% of the kidney cancer patients are accidentally found in physical examination or other regular medical tests since there are no obvious signs or symptoms in the early stage. However, the prognosis of majority of early stage kidney cancer patients is very good. Therefore, regular medical check-ups are very important. Typical local symptoms: Hematuria or bloody urination, pain and lumps are three main symptoms of kidney cancer. Most of the patients may show 1 to 2 symptoms when they are diagnosed, very few people would have all the three symptoms, which may only accounting for about 10%. Bloody urination: When bloody urination occurs, there is no sense of pain, and the outbreak is intermittent but visible by naked eyes. The intermittence will be shortened with the development of the cancer. A great amount of bleeding may be associated with renal colic. Pain: Pain, met in 50% of the cases, is also an advanced symptom of kidney cancer. It appears due to the gradually compression of the growing tumor to the renal capsule or renal pelvis. Or persistent waist dull pain caused by the invasion of tumor to the surrounding organs and psoas. Lump: lumps are also a common symptom of kidney cancer. 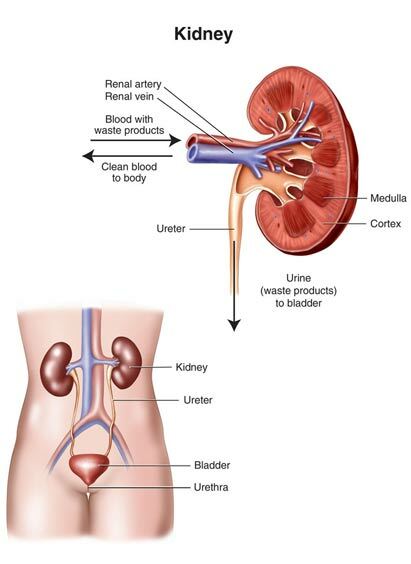 Enlarged kidneys can be seen in about 1/ 3 to 1 / 4 kidney cancer patients when they see a doctor. Due to the hidden position of kidneys, the lumps are very difficult to find before growing to a certain volume. When the mass is palpable in abdomen, the patients have usually been in the advanced stage. Systemic manifestations: Commonly, 10% to 40 % of the patients may accompany with paraneoplastic syndrome, which may manifest as high blood pressure, anemia, weight loss, cachexia, fever, polycythemia, abnormal liver function, hypercalcemia, hyperglycemia, elevated ESR (erythrocyte sedimentation rate), or neuromuscular pathological changes. About 2% to 3 % of the cases could show varicocele of the spermatic vein or abdominal wall varices. Metastatic symptoms: Approximately 10% of the patients visit the doctor because of a metastatic symptoms and 30% of the newly diagnosed cases show metastatic signs. Metastatic symptoms of kidney cancer can be bone pain, fracture, cough and spitting of blood. Experts from Modern Cancer Hospital Guangzhou remind you that the clinical manifestations of kidney cancer are changing individually. If you are happening to the above symptoms, consult a professional doctor in a timely manner and do necessary examinations as soon as possible.